The 2010 Mercedes-Benz CLS is undergoing testing, and as is true with so many segment-defining vehicles, there doesn't look to be much of a change going on up top. However, down below, in the area covered by cladding, we will probably see some noticeable tweaks and refinements as the original "four-door coupe" moves from the current E-Class to the new E-Class platform (it will not be built on the S-Class platform). As for engines, in addition to gas and (in Europe) diesel options, it will be offered with the BlueHybrid drivetrain from the S400. In the mean time, for 2009, the CLS gets revised front and rear, a new grille, larger outside mirrors, and LEDs in the tail-lamp clusters. Inside, a new steering wheel complements the reworked interior and a next-generation COMAND system. 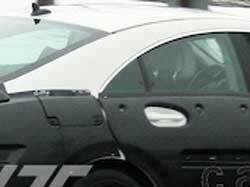 [Source: Next Autos]Spy Shots: Next-generation Mercedes-Benz CLS originally appeared on Autoblog on Mon, 29 Dec 2008 17:58:00 EST. Please see our terms for use of feeds.